Let’s start with Tesla, shall we? 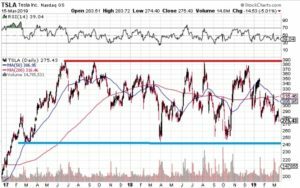 Tesla has strong support just above $240, and strong resistance at just under $390. So, the question is, which resistance level gets tested first? I’m betting it’s the lower one, and I will not be at all shocked if $240 is broken soon. If Tesla made gas cars I would say they are leaking oil, but I guess that analogy does not work here. They made a show of introducing the Model X, which is essentially a PT Cruiser. The market laughed, and Tesla dropped 5%, the first time a new product announcement was treated with derision. They have no cash, and they have no factory in which to make this car, and they have closed many of their stores and laid off a big chunk of their workforce. I’m holding puts, and will continue to do so. 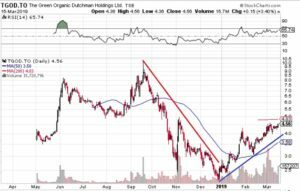 Of more interest to me is TGOD.C – The Green Organic Dutchman, my favorite cannabis stock. I bought it as a private placement prior to the IPO last year, so I am sitting on a profit. The stock got way ahead of itself, hitting $10, before crashing to $2. (My shares were restricted, so I couldn’t sell at the peak). No worries, it has more than doubled since the start of the year. It would appear that we are in a consolidation phase now, but I expect that by the end of the spring it will break through $5, and when that happens $10 is the next target. Finally, our thoughts turn to gold. I present for your edification a ten year chart. We had a great run in 2010 and 2011, followed by a five year bear market. Since the low around $1,050 at the end of 2015 gold has been in a jerky consolidation phase, with $1,400 the next important target. I assume it will get there this year, but who knows, the consolidation could continue for a while. We shall see. I’m holding, having added to my positions during periods of weakness. 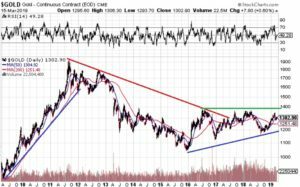 My favorite gold holding is EQX.V – Equinox Gold Corp. It had a long correction period, but that’s over, so I expect to see $2 later this year.